Claudia has lived on the Big Island since 1964. She has memories of watching the eruptions of Kilauea as a child, and they still inspire her today. 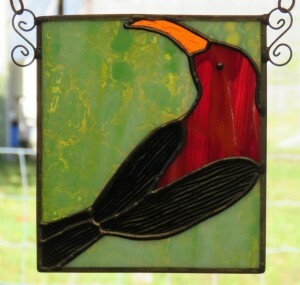 She started working in stained glass in 2006, when a friend gifted her with a piece. She loved the way the sunlight played through the different types of glass, and wanted to explore the possibilities of interpreting the natural world, and interest spurred by her mother’s love of art and her grandmother’s love of birding. 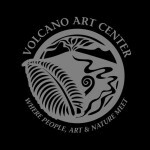 Her goal is to interpret Hawai`i’s unique environment through the stylized lens of stained glass. Claudia’s panels are made by the copper foil technique, starting with the pattern design. She uses a computer program that allows her to edit shapes and glass choices. Once the pattern design is acceptable, the second phase is choosing the right glass, color, opacity, texture, and orientation and tracing the pattern pieces on the chosen glass. Cutting and assembling is the third phase, a process requiring a variety of hand and power tools. After smoothing all sharp edges, each piece is wrapped with copper foil. Soldering forms a strong bond that holds it all together. Cleaning, applying patina, and polishing brings the piece to live. A complicated project may take 10 hours per square foot to complete, not including pattern design. Glass may be scratched by abrasive cleaners or scrubbers. Clean with any glass cleaner then polish with Carnuba paste wax or “Never Dull”, found at most hardware stores. Panels may be damaged by flexing the piece or sharp jolts. If laid flat during cleaning, care should be taken to evenly support all sections. Hang securely using a chain, fishing line, or other material strong enough to support the panel’s weight. Her preference is a 65 lb. test braiding fishing line. View more work by Claudia McCall by visiting her page on our online store here.